If you've been looking for something different but extremely powerful to add to your new or existing website, then you're going to love this script! Not only is this newly developed matrix script the definite supreme master of matrix programs... it's built to outlast and outplay all others. It combines the features of the most popular matrix types seamlessly; including forced matrix and company forced matrix (left to right, and top to bottom without any holes). With the ability to payout commissions up to 10 levels deep in as many matrices as you see fit to define, you'll have no problem luring new members to join your matrix program. You can even include special bonuses for each individual matrix position purchase. 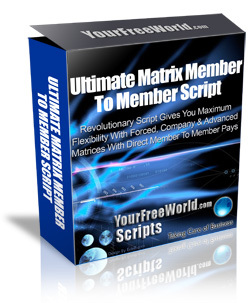 The stand out feature for this complex script is that it allows members to send instant monetary gifts of the matrix position fee direct to other members through your program. Why member to member? It gives members the perception that it's all about them, and we know how much network marketers like that don't we? It also makes you look good when you offer 100% commissions -- and who doesn't LOVE that? So how do you make money? If someone joins without a sponsor, the gift goes to you. It's entirely up to how you want it to play out. Setup is a one-time task that covers every base and is straightforward to complete. 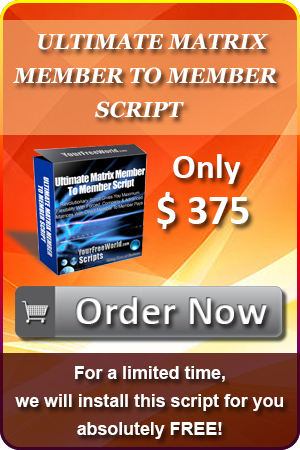 You'll find this an extremely versatile, powerful script -- and like all YourFreeWorld scripts, it's very easy to install and be up and running in just a few hours. Then you will find how easy it is to start generating more income, while building a powerbase of responsive members. The best part is the 'instant webmaster attractor factor' -- the built-in functionality of extreme flexibility to the administrator, allowing them to choose the settings they wish to use to make the program unique and highly appealing to new members.